Since 2005, the inVNE simulation environment and the radar simulator (RaSi) of in-innovative navigation GmbH have been successfully operating in the German Water Police Academy (WSPS) in Hamburg providing schooling for all officers of the Water Police throughout Germany. The future skippers are trained on virtual bridges for radar navigation on coastal and inland waterways. The simulation system is regularly enhanced and updated by in-innovative navigation GmbH and adapted to current technologies. At the beginning of July this year, the most recent modernization for the system architecture was presented and passed the Factory Acceptance Test (FAT) by the WSPS. Simultaneously with the hardware upgrade, the software for controlling the exercises will be fundamentally renewed. The so-called supervisor interface of the trainers then combines all functions for preparation (creating, editing exercises …), planning, execution and evaluation of training sessions. Furthermore, a running simulation can be switched to freeze mode at any time to allow a briefing or an immediate analysis of a training situation. In contrast to a normal simulation pause, all radars and display systems continue to be supplied with data in freeze mode, so that disturbing error messages are avoided. New interactive controls, e.g. 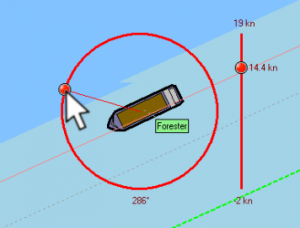 setting course and speed or as well as dynamic waypoints for a simulated ship, enable a quick adjustment of scenarios while the exercise is in progress. Proven and user-friendly features that make RaSi so unique among radar simulators, such as the highly realistic radar generation, cooperative training and live AIS feed have also been enhanced and improved. The implementation of the modernized system is planned for the month of August during vacation time of the busy school.